Luxor temple is the most significant religious Egyptian temple that was built by Amenhotep III (1390-1352 BC). Its construction was completed by Tutankhamun (1336-1327 BC) and Horemheb (1323-1295 BC). It is located on the east bank of the Nile River in Luxor city, which was known as Thebes. It is the reason why Luxor has earned its name “The World’s Largest Outdoor Museum“. It is considered to be one of the most impressive visits in Luxor because of its structure and its relief carvings. There are many impressive temples in Luxor such as Temple of Seti I at Gurnah, Hatshepsut temple at Deir el Bahri, the temple of Ramses II, and the temple of Ramses III at Medinet Habu, which you can visit them through one of our breathtaking Egypt Nile cruises packages. The two primary worship temples on the east bank are known as Karnak temple and Luxor temple. Luxor temple was considered, “The Place of the First Occasion“, where the god Amun experienced rebirth during the pharaoh’s annually reenacted coronation ceremony and it was dedicated to the renewal of kingship. Behind the temple, there are chapels built by Amenhotep III of the 18th Dynasty, and Alexander. The temple was a legionary fortress and the home of the Roman government in the area during the Roman era. The construction of Luxor Temple started in the 14th century during the reign of Amenhotep III and Horemheb & Tutankhamun added columns, statues, and friezes. Akhenaten installed a shrine to the Aten instead of his father’s cartouches. The first major expansion of the Temple occurred after the first construction with about 200 years by Ramses II that is why Luxor Temple is a unique destination for having only two pharaohs, who contributed into its construction. The statues of Mut “The War Goddess“, Khons “The Moon God“, and Amun were sailed down the river to Karnak every year to ensure the flooding of the Nile. The temple was largely buried underneath accumulated river silt with the Arab conquest and Abu Haggag Mosque is at the top of this courtyard which is the main reason for discovering Luxor temple. This magnificent temple was built with sandstone from Gebel El-Silsila. This sandstone was referred to as Nubian sandstone that was used for the construction of monuments in Upper Egypt. The Ancient Egyptians had a common technique in the construction of monuments, which was symbolism or illusionism, for example, a sanctuary shaped like an Anubis Jackal was really Anubis for them. 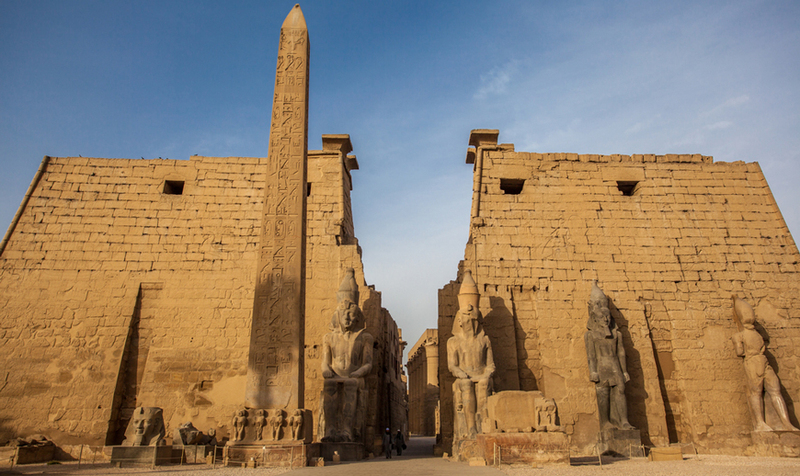 There are two Obelisks at Luxor Temple, which have different height but they give the illusion that they have. Luxor temple has always been known as a sign for Opet Festival as the temple was dedicated to the Theban Triad of the cult of the Royal Ka, Amun, Mut, and Khonsu. It was built during the New Kingdom, the focus of the annual Opet Festival, in which a cult statue of Amun was paraded down the Nile from nearby Karnak Temple to stay with his consort Mut in a fertility celebration. Luxor has always been a very important religious center for the ancient Egyptians. Luxor Temple, which is located near the banks of the Nile, was dedicated to God Amun, who was associated with Mut and the Theban Triad, which you must add a visit to this amazing place during your Egypt tour packages. Luxor temple is huge and has several pylons. The first pylon is more than 70 feet high that was built by Ramses II and it is fronted by massive statues and several obelisks. This pylon is decorated with scenes from Ramses military triumph. There are many areas, which were used for worship purposes. There are also other additions such as a shrine of Alexander the great, and a Roman sanctuary. The causeway of the entrance is linked by many sphinxes, which is known by the sacred way or the Avenue of sphinxes. There are six colossal statues of Ramses in the entrance of this astonishing temple. Four of these statues were seated and two were standing but only two seated statues have survived. There is a Hypostyle Hall, which was the first room of the Opet Temple. There is also a surviving granite obelisk that is about 25 meters high. A peristyle courtyard was built by Ramses II. After crossing the courtyard, there is processional colonnade, which was built by Amenhotep III that is lined by 14 papyrus-capital columns. There is another peristyle courtyard, which also dates back to Amenhotep’s construction. There is a Barque shrine that was built for Amun by Alexander and the Birth shrine of Amenhotep III with scenes of his symbolic divine birth. The last chamber inside the temple is called the Sanctuary of Amenhotep III, which was considered the most sacred chamber inside the temple.